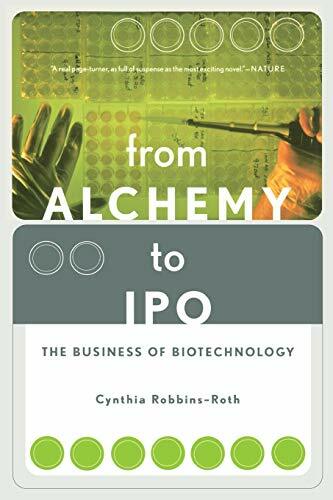 Written by a well-known industry insider, this title addresses the coming-of-age of biotech products and companies and traces the history of biotechnology from its early inception in the '70s to today's heyday of new solutions and breakthrough treatments. "A tour-de-force for anyone who is interested in the biotech industry. I applaud the enormous achievement of Cynthia Robbins-Roth. "-Frederick Frank, Senior Managing Director & Vice Chair, Lehman Brothers"From Alchemy to IPO tells the dramatic story of this revolutionary industry as only an insider can. "-George Rathmann, President and CEO, ICOS Corporation, Chairman Emeritus, AmgenWritten by a well-known industry insider, From Alchemy to IPO addresses the coming-of-age of biotech products and companies and traces the history of biotechnology from its early inception in the seventies to today's heyday of new solutions and breakthrough treatments. It describes the amazing entrepreneurial trail of product development, novel business models, and critical trials that eventually pave the way to market. This is the first book to accurately record the inner workings of an industry-biotechnology-that's on the verge of living up to its monumental promise to change the world as we know it.